Who’s Holding that Library Card? New Jersey wasn’t a battleground state during the Civil War, yet a surprising ‘find’ by the New Jersey Room of the Jersey City Free Public Library brings the Civil War into local focus, up front and center, during this 150th commemorative year of that war’s beginning. The story of how the 220-year-old order book Stafford County, VA ended up in the Jersey City Free Public Library is one for the history books. This volume, and the other that was found – a biographical record, Grand Army of the Republic, 1893, Personal War Sketches, G. Van Houten Post No. 3, Volume 2, which identifies local New Jersey and New York soldiers – provides incredible insight to the journey made by these two volumes. The archival book transfer happened on Thursday morning, October 20, 2011. Research reveals that Stafford County is a county in Virginia that is among those termed the “burned counties” for the amount of records of historical and genealogical interest lost during the Civil War due to the depredations of battles and to acts of vandalism in which records were seized by Union soldiers and taken as souvenirs. The Library of Virginia is the repository that holds many of the records that still exist from the colonial era. “It is time for this volume, after nearly a century and a half, to be returned to an institution where it can be preserved and made accessible to researchers,” said John Beekman, MLIS, New Jersey Room assistant manager. “The Library of Virginia is pleased to accept this volume on behalf of the Stafford County Circuit Court Clerk and the citizens of Stafford County and the Commonwealth of Virginia,” said Director Carl Childs of Local Records Services, Deputy State Coordinator, State Historical Records Advisory Board, Library of Virginia: Archive of the Commonwealth, in Richmond, Virginia. “The return of this volume helps to fill a gap in the history of Stafford County and its inhabitants." “For the Library of Virginia to receive back a unique, irreplaceable 18th Century ledger almost 150 years after it was stolen and after all expectation of its return had long ago died, is nothing short of miraculous. Perhaps other archivists will be inspired by John's action to take a closer look at items that don't really fit the scope of their collection and find more suitable homes or even the rightful homes for any such items,” added New Jersey Room manager Cynthia Harris, MLS. Carl Childs has worked at the Library of Virginia since December 1993, beginning his career as a library assistant and working in a variety of archival positions in state and local records. Since April 2005, he has served as the Director of the Library’s Local Records Services Branch, which is charged with helping to preserve the permanent records of Virginia’s circuit courts. He also serves as deputy coordinator of Virginia's State Historical Records Advisory Board (SHRAB), is a member of the Mid-Atlantic Regional Archives Conference (MARAC), and is currently pursuing a Certified Records Manager (CRM) designation. 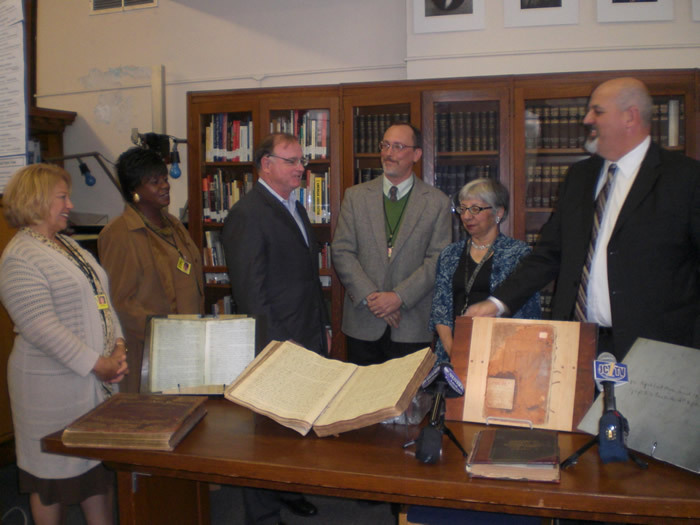 BACKGROUND: Since Cynthia Harris became manager of the New Jersey Room of the Jersey City Free Public Library in 2001, projects have been underway to explore the “buried treasures” that have been in storage in the library’s special collections, and to arrange and make accessible this material. In 2006 assistant manager John Beekman was hired, and assigned to assist further with processing archival and special collections. Among the principle collections, is material collected by the Historical Society of Hudson County, active in the first half of the 20th Century. Many materials collected by the society were later added to the main local history collection, but a great deal more was put to the side for years. As the 150th anniversary years of the U.S. Civil War began, John began to look more closely at what materials were in storage that may be relevant to that great and terrible event in our country’s history. Two large books in boxes simply labeled Civil War came to his attention. The first of these turned out to be a collection of the war service records and experiences of member of the Van Houten Post of the Grand Army of the Republic, an organization of Jersey City veterans of the Civil War – which will be a valuable addition to the record of local involvement in the conflict. Library can finally make right after nearly 150 years. A series of notations on the inside cover of this handwritten volume tells the story. According to a note on the inside front cover, the volume was prepared in October of 1791, and is a transcription “in a fair and legible hand” of the Court of Stafford County from 1749 to 1755. A note on the next page reads “Taken from Stafford Court House, March 30, 1863. By Capt. W. A. Treadwell 4th N. York Regiment.” Another note records that Capt. Treadwell presented the volume to Charles B. Duff, no date listed. A final note records that the volume was presented to the Hudson County Historical Society by the Estate of William Brinkerhoff, a former NJ State Senator and member of a prominent Jersey City family. The New Jersey Room is a collection of materials about New Jersey with an emphasis upon Jersey City and Hudson County. The collection includes both current and historical information and numbers about 20,000 volumes. While the New Jersey Room is the main resource of information on the history of Jersey City, many of its patrons come in search of information on local real estate, development, business information, and genealogy research.